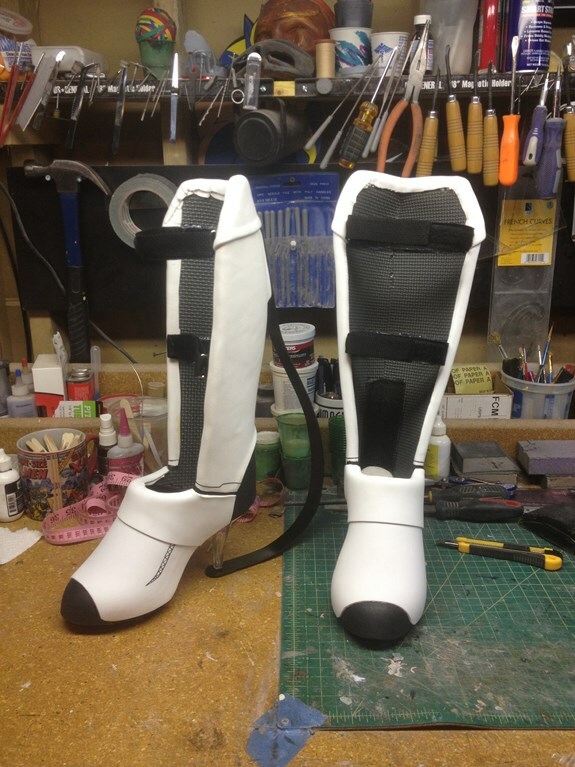 I got a commission to build a pair of the Long Fall boots from Portal 2. I figured this would be a pretty extreme test of my ability to create something that actually served a function. 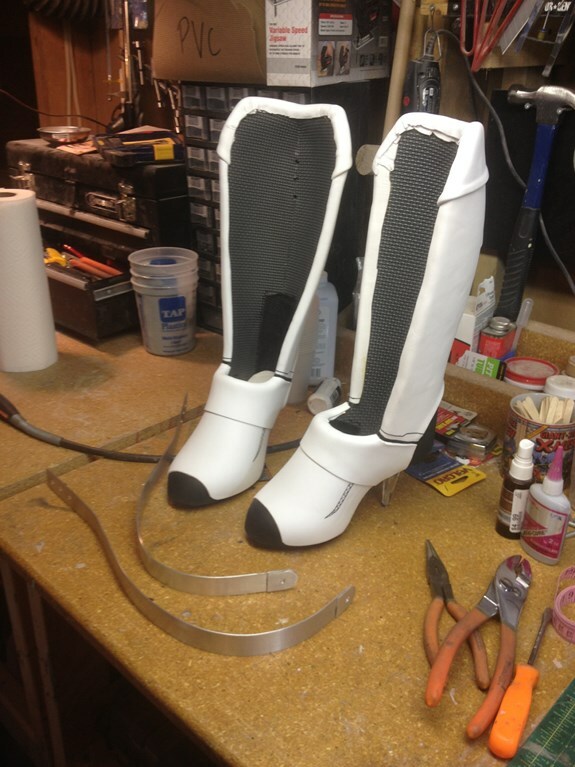 I had a little help with the design; my wife created similar boots a couple of years ago for her Chell costume. 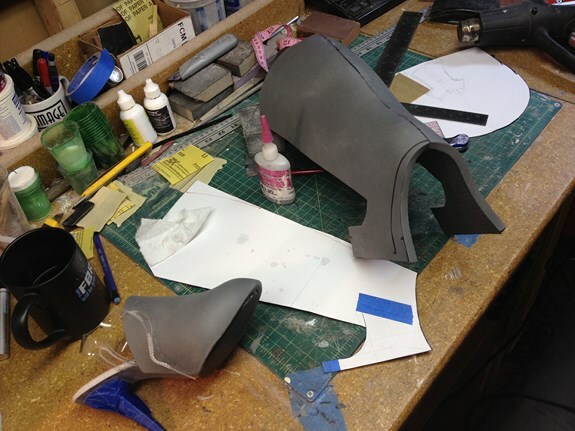 The main difference in my design was that they would be made from EVA foam. There have been several ways that people have solved the problem of the heels on these boots. 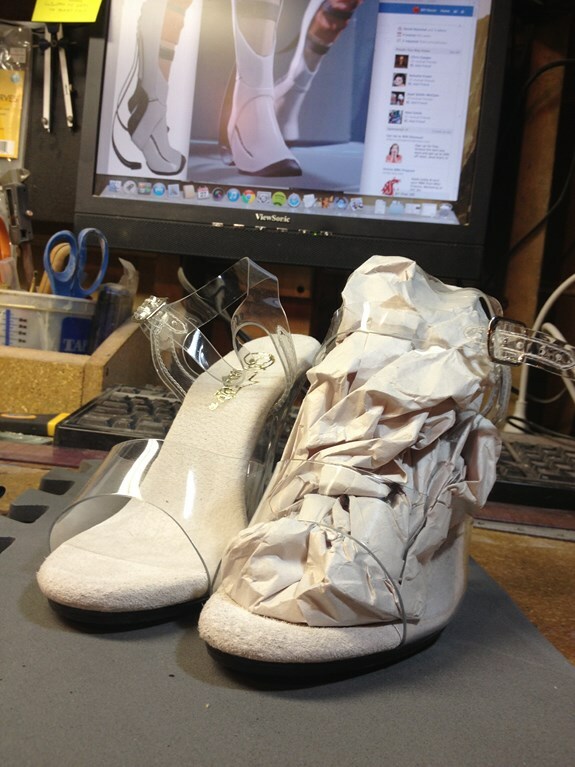 I decided to go the same route as my wife and build them on existing high heeled shoes with clear plastic heels. I nabbed these 4″ stripper heels from Amazon in the appropriate size for the client. 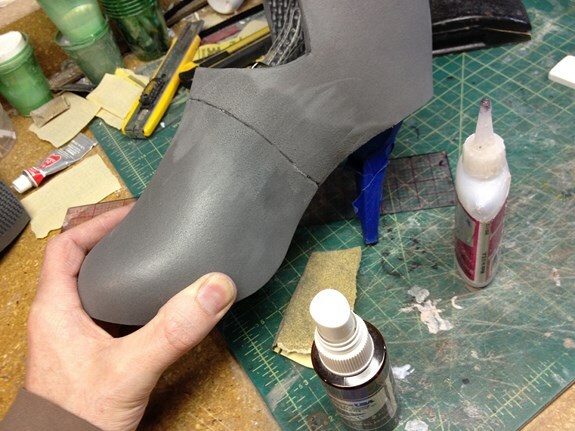 The outer shell of the boots were created from heat formed EVA foam floor mats. 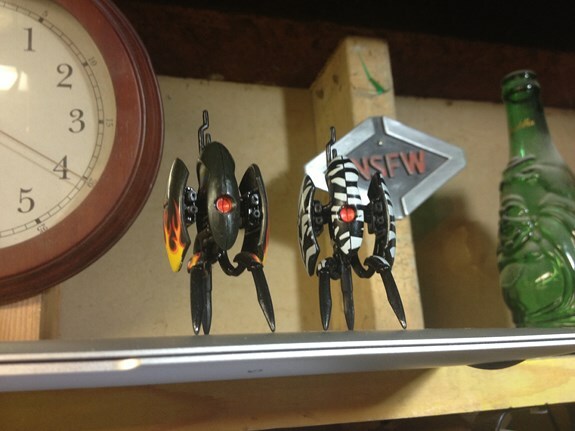 For the most part, these were templated on the fly in a very “trial and error” method. What you see in the final product is not the first try, not by a long shot. 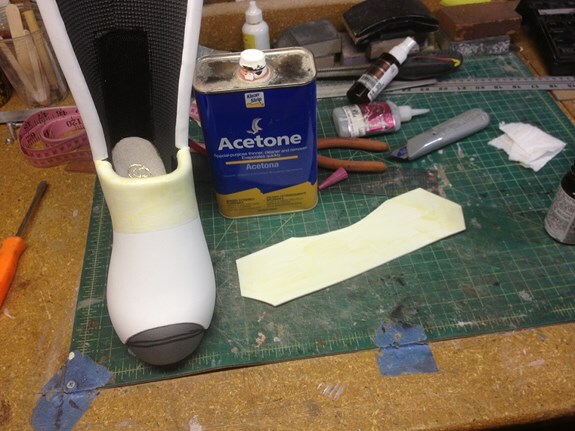 After taking measurements from the plastic heels, I laid out a flat paper template and cut it out of the foam then formed it by hand with a heat gun. The real trick was figuring out a way to build the covering in pieces, then design a way to cover all of the seams. 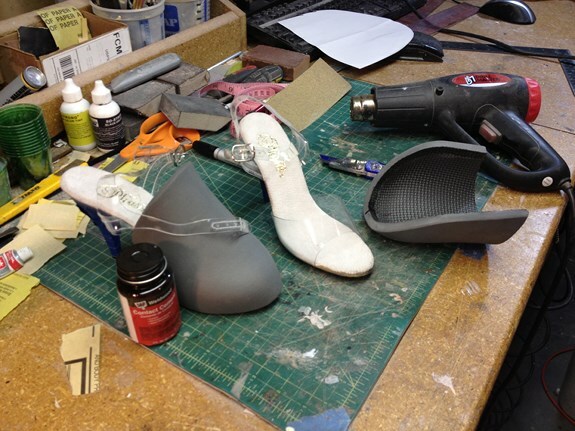 When I had the toe pieces formed, I attached them to the shoes with contact cement. 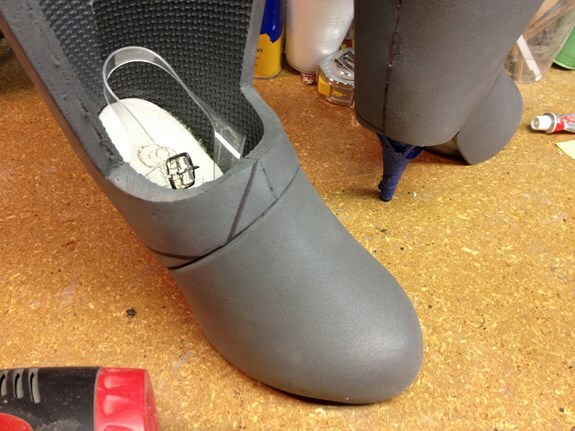 The back parts of the boots were done in the same manner, but made from two pieces so that I could form a complex curve along the back side of the leg. 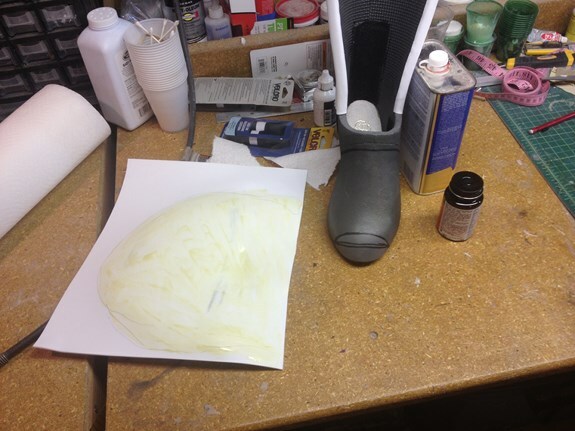 Again, these pieces were heat formed by hand until the fit nice and snugly around the shoe. 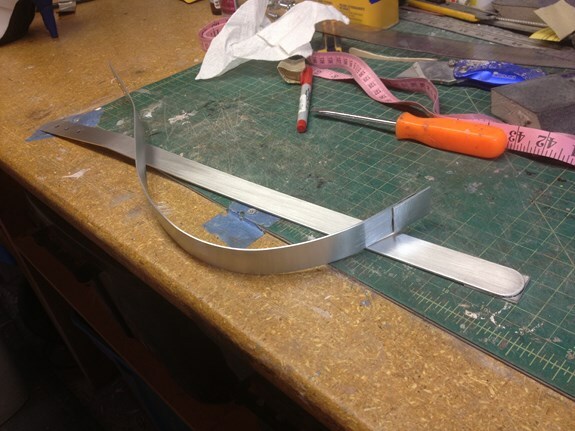 I designed the connecting elements of the template to be a little big so that I could trim them to size once I had the forms figured out. 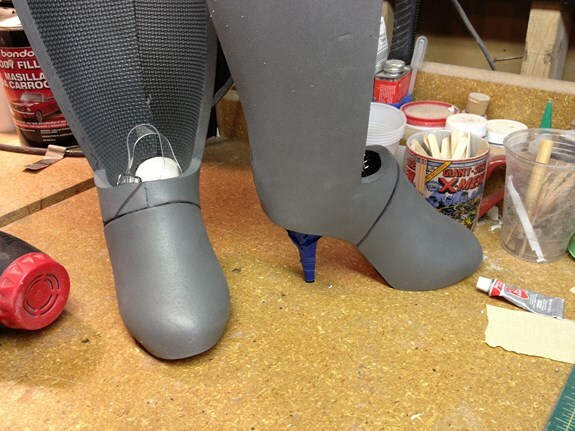 The back pieces were also attached to the plastic heels with contact cement. The plastic ankle strap inside of the shoe was eventually removed entirely after a test fitting on a friend with appropriately sized feet (my size 12 boats wouldn’t even come close to fitting into these things). These jerks were no help at all. I sanded down the seam between the front and back pieces with a drum sanding bit in my drill press. 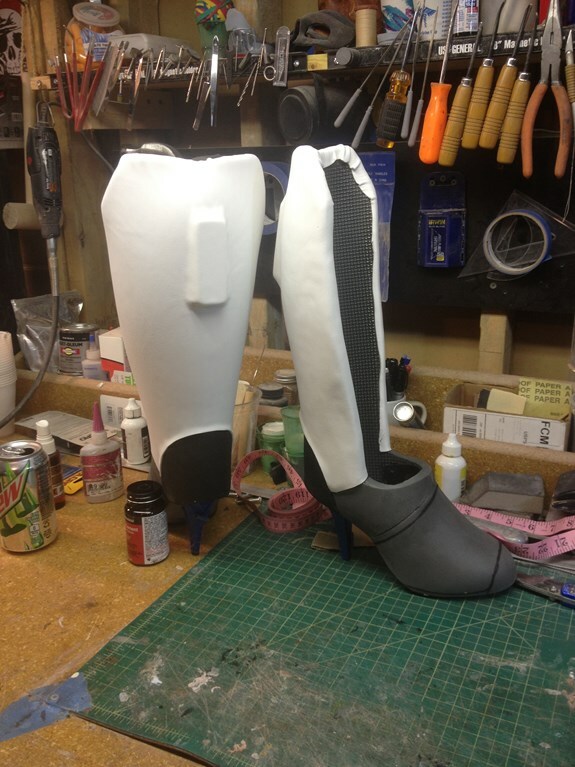 The plan was to cover this seam with white EVA foam later on. 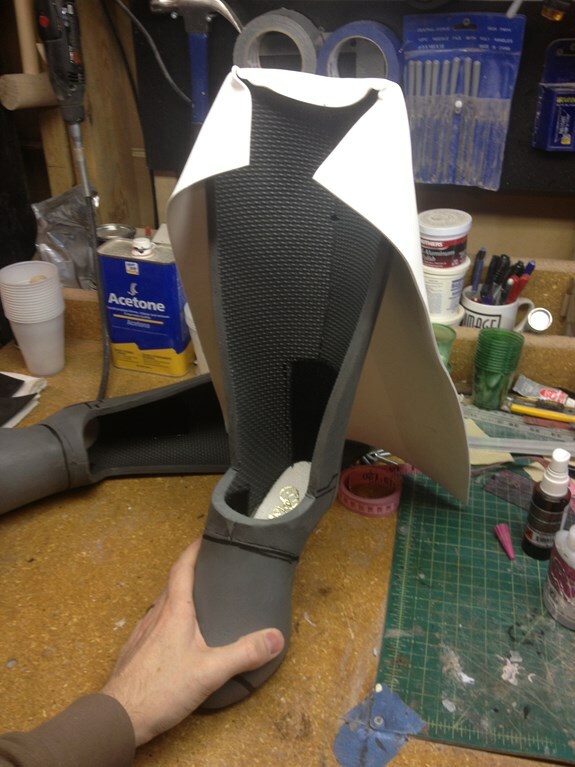 With the shape all figured out, I covered the gray foam with 2mm thin EVA craft foam. This was done with contact cement and took several tries. This kind of covering is prone to wrinkles. Lots of swearing happened. Also, not pictured is the flat piece at the top/back of the boot where the spring piece would be attached. It’s a rectangular piece of 1/4″ PVC with three holes drilled into it. 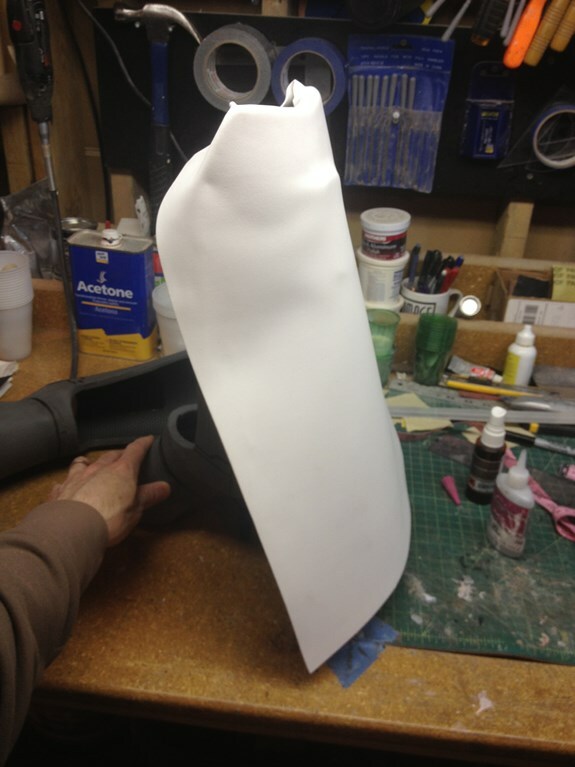 It was cemented to the back of the boot before the white covering was applied. Again, I can’t reiterate enough how much of this build was a frustrating trial and error process. Here you can see some of the wrinkles. I ended up ripping off and sanding most of the white foam off for a 2nd try. Eventually I was able to get a satisfactory covering on the boots. 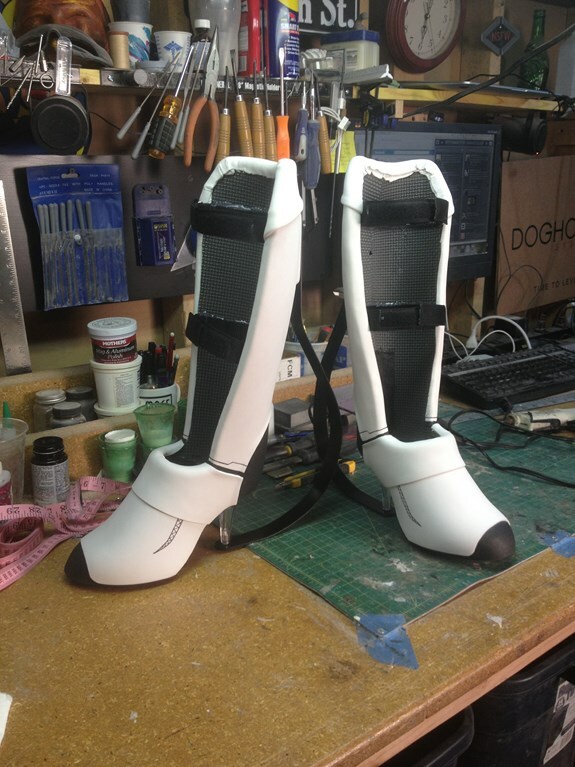 The black heel parts were done in 2mm black EVA craft foam and the white parts were overlapped over them. The toe coverings were done the same way, just with a couple of layers of the white to get the seams the way they needed to look in the reference. I generally tried to template the pieces too big, cement them down, then trim the extra that flopped over the sides. The toe tip was painted black with some enamel paint and the lines were drawn in with a fine tipped marker then painted over with enamels. The heel springs were actually quite straight forward. Since the client would be standing on her shoe heels, the springs didn’t need to do anything other than look good. I built them from thin strips of aluminum. It was easy enough to bend to shape by hand. I reinforced the bottom part with another layer of aluminum and some J.B. Weld. The stripper heels came with a plastic cap over an attachment rivet thing. 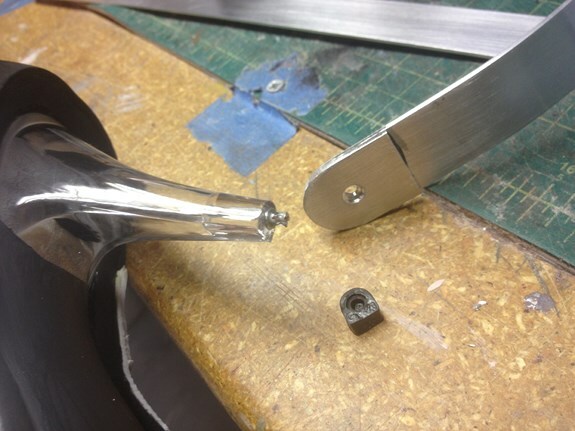 I was able to pry the plastic cap off and repurpose the rivet through a hold drilled in the heel springs. 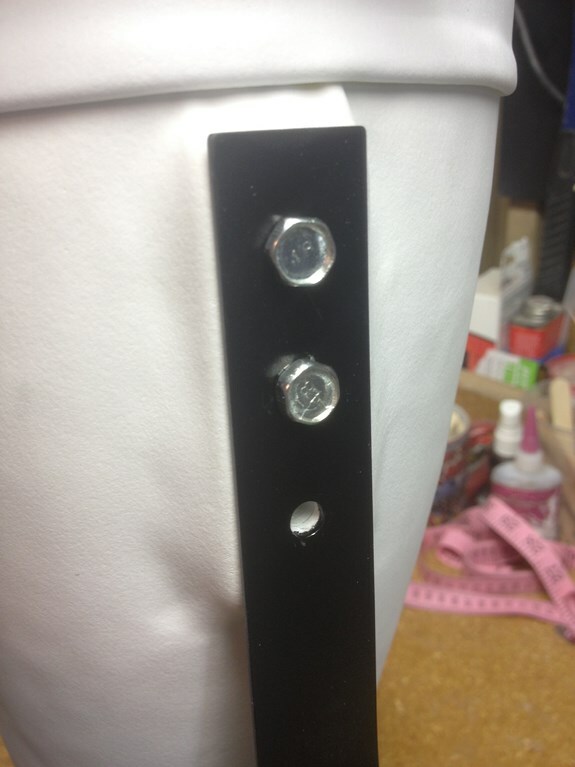 The tops of the springs got three holes drilled into them to match the attachment points on the back of the boots. After a quick black spray paint on the springs, they got glued into the boots with some hex bolts. The very last thing the boots needed was a way to keep them attached to the client’s legs. I added a couple of nylon webbing/velcro straps to each boot along with a D-ring so that they could be tightened to size.